Information herein does not replace advice from your doctor. 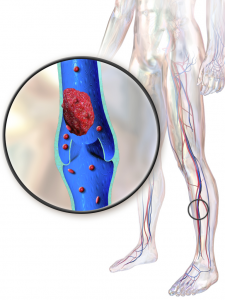 Deep vein thrombosis (DVT) occurs when a blood clot forms in a vein deep in the body. 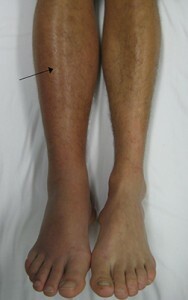 Typically, this condition manifests in the major vein of the leg. In rare cases, this condition can occur in the arms, pelvis, and any other part of the body with a major vein. The ability to recognize DTV symptoms is essential to combating abnormal clotting complications. The danger of this condition is that a blood clot in the leg could be released into the blood stream (embolus) and travel through the heart and to the lungs. A pulmonary embolism (PE) occurs when the clot becomes trapped in the smaller network of vessels of the lungs. A PE is life-threatening as the impacted lung tissue is robbed of oxygen and dies, which also prevents the rest of the body from receiving oxygen. Arteries and veins are responsible for circulating blood throughout the body. Veins are low-pressure vessels and carry deoxygenated blood from the body back to the heart. Arteries, conversely, are muscular and high-pressure vessels that transport oxygen-rich blood from the heart to the rest of the body. Deep veins, like in your arms and legs, are different from superficial veins and donâ€™t present the same risks with regard to clotting. On a day-to-day basis, blood clots that form as a result of impact or injury dissolve in the blood stream without medical intervention. Blood clots that donâ€™t dissolve, however, and grow can be dangerous and even life threatening. 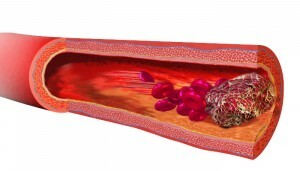 Blood clots that occur in the arteries are typically associated with blockages (plaque) within its walls. The heart continues to push blood through narrowed /obstructed arterial passages and sometimes this process leads to ruptures in the plaque on the walls of the arteries. The body responds by creating a clot, which can be released into the blood stream to the heart and brain and results in a heart attack or stroke. This type of clot is different from those that form in superficial veins (close to the surface of the skin), which tend to remain in place. Varicose veins, for example, will not produce clots that dislodge and travel to the heart. Clots that originate in the thighs have a greater tendency to release and travel to the lungs than those that form in the lower leg. Typically DVT symptoms will present themselves following some sort of physical trauma or following a prolonged period of immobility. Deep vein thrombosis usually affects the lower leg and thigh and almost always presents on one side of the body. One, some or all of these DVT symptoms may be present upon diagnosis. A patient may also exhibit no DVT symptoms, which makes it a difficult to identify a blood clot in the leg immediately. In some cases, deep vein thrombosis is only revealed after the blood clot in the leg has been released into the blood stream and to the lungs. If the clot is large or if there are many clots, a PE can cause death. Some patients with DVT might develop post-thrombotic syndrome, which is the result of pressure-related complications owing to obstructed blood flow. Some symptoms include: leg swelling pain and changes in skin coluration. Recognizing DVT symptoms and VTE could be the key to getting the care you need and saving your life. A doctor will form their diagnosis based on assessing your DVT symptoms along with a physical exam. A doctor will most likely also consider a patientâ€™s general health, other prescription medicines and whether or not theyâ€™ve had surgical procedures, injuries or treatment for cancer. Venography The patient is injected with a contrast agent, which highlights the presence of blood clots in an x-ray. 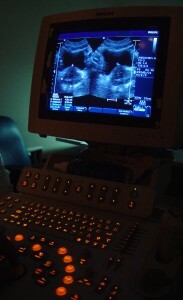 This is the most effective way to locate and identify obstructions but is considered more expensive and invasive than other imaging techniques. When a patient is diagnosed with deep vein thrombosis, the aim of their treatment is to minimize any blood clots and, most importantly, to prevent them from dislodging. Once blood clots are managed, treatment is geared towards preventing another occurrence of deep vein thrombosis. Blood thinners (anti-coagulants) these medications decrease the bloodâ€™s ability to clot, prevent existing clots from growing as well as reduce the risk of additional clots developing. These medications are taken for a period of 3- 6 months. Compression stockings these stockings apply pressure on your feet and improve blood flow. They can aid in reducing swelling and pain. It is important that you buy stockings with the correct compression level as prescribed by the doctor. These socks need to be worn everyday. Clot busting In some rare instances, a thrombolytic agent is used dissolve a blood clot. This treatment is used for large clots, for high-risk cases of PE, and those who have DVT in the arm. The drug is administered directly to the clot via a catheter. This procedure is performed in a hospital as it is invasive and involves higher risk . Vena cava filter In this procedure, a metal filter is inserted into the vena cava via a vein in the neck, arm or leg. Once inserted, the filter is used to capture clots while allowing blood to flow through the veins. Â This is also a invasive proceduer. Venous thombectomy this is a surgical procedure used to remove blood clots in severe cases of DVT. Studies show that some people are genetically disposed to abnormal clotting complications but anyone can develop a blood clot in the leg from trauma, immobility or a pre-existing medical condition that affects the bloodâ€™s ability to clot. The risk of the blood clot in the leg leading to a pulmonary embolism (together referred to as venous thromboembolism or VTE) is heightened when certain risk factors are present. Those over the age of 60 are more susceptible to VTE but heart disease and high blood pressure will increase the risk of clot formation at any age. Certain cancers (pancreatic, ovarian, and lung) and chemotherapy also heighten the risk of dangerous blood clots. Women during pregnancy and 4-6 weeks after giving birth are also vulnerable to abnormal clotting complications. Any combination of these risk factors will, of course, heighten the risk and dangers of VTE. It is essential to understand underlying causes and to recognize DTV symptoms to avoid serious complications. The most serious complication associated with deep vein thrombosis is a pulmonary embolism and nearly 25% of those who experience it will die. The chances of survival, however, are high if the condition is identified and treated promptly. It is, therefore, essential to notify a doctor immediately if you experience any DVT symptoms. Typically, deep vein thrombosis occurs due to prolonged periods of immobility. When the legs are held in a horizontal position for a prolonged period of time, the blood can pool in the leg leading to the formation of blood clots. Whether, an individual is bed-ridden after an injury or accident or has limited mobility following a surgical procedure, the risk of clotting is a danger. Even lengthy periods of sitting (on a plane or in the car) can heighten the risk of clotting complications. Depending on the risk factors present, a doctor might prescribe medication as well as therapeutic treatments in order to prevent possible complications associated with abnormal blood clotting. In many cases, a blood clot in the leg disappears without medical intervention but this is a condition that can persist. This type of clotting issue is a health concern that should be taken seriously. Left untreated, clots will grow and there is a risk that they will dislodge and travel to the lungs. Since a dislodged clot can be life threatening, those with this condition need to have regular check-ups with a doctor and take their prescribed medication as well as follow any other therapies to manage pain and swelling.